OwnEnergy Inc. has found a market niche in wind power, specializing in partnering with local entrepreneurs to move community wind power projects along the development curve. 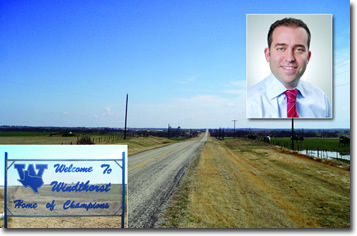 It currently has a pipeline of 26 wind projects, representing some $3 billion of total potential investment in rural communities in the U.S.
OwnEnergy CEO Jacob Susman (above) is working with local business interests to build a 51 MW wind farm project near Windthorst, Texas, just outside Dallas. Much of the future of small and community wind in the United States lies in the rural areas of the country, where wind resources are abundant. But part of the future of small and community wind is coming together in a small office in Brooklyn, New York, within sight of the Brooklyn Bridge. That's where OwnEnergy Inc, a company specializing in mid-sized, locally-owned wind projects, has set up shop just across the river from Manhattan. Susman. "Our local partners carry the local aspects of project development, such as siting, wind measurement, and community relations, while we focus on the middle and later stages of development that are more complex and require more capital. "These stages of the development process involve Power Purchase Agreements, equipment procurement, and project financing negotiations, with the ultimate goal being to construct wind power projects." Madrid, Lisbon, London, Frankfurt, and Juno Beach, Florida. "None of these companies is located in the windy parts of the U.S., and four of them are not even based in the U.S.," he adds. At their office in Brooklyn, Susman and other members of the Own-Energy team engage with local partners to shepherd wind power projects through all stages of the development process, from initial feasibility through construction and operations. A critical component of the process is understanding what the financial markets will bear, but the key differentiating part of their business approach involves local ownership in wind power projects. "OwnEnergy is a community wind development company and a platform for clean energy entrepreneurs," explains Susman. "Before we set up the company, we noticed a tremendous amount of local activity and local business initiative around wind development-outside the typical IPP or utility development model-that was not being tapped. "These were local folks who were interested in getting involved in developing wind farms in their communities. But they were not able to advance their projects beyond a certain stage-even though they had put in all this terrific effort, had the local contacts and, in many cases, had invested significant capital." OwnEnergy was set up as a business to help these local entrepreneurs complete their projects and develop more community-owned wind farms. The company was established about three years ago and now has a pipeline of 26 wind projects, spread across 12 U.S. states, representing $3 billion of total potential investment in rural communities. Some 500 MW of that is at a middle or advanced stage of development. OwnEnergy is staffed by a youthful group of veterans of the wind power business. They have experience with major utilities, IPP developers, investment banks, and wind industry suppliers. Company CEO Susman used to work at utility giant AES Corporation in Spain, where he learned the fundamentals of power project development in a market where renewable energy was becoming a major influence on the power market. From there, he became a member of the alternative energy team at Goldman Sachs. "I was able to spend a lot of time working on an investment the firm had in Horizon Wind Energy," says Susman. "I took some of my observations from there and from working at AES, and used the bulk of our family's savings to get OwnEnergy off the ground." The experience at AES and as a wind energy investor has been very helpful, he says. 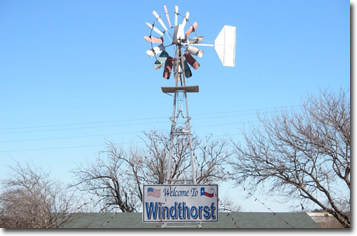 There could be more modern wind energy being generated in Windthorst, Texas very soon. OwnEnergy developed the wind power project in Windthorst-which is expected to start construction this year-as a joint venture, along with a local company, Horn Wind. "It's important in a couple of key areas. The first is being able to identify what the investing world sees as a 'pain point' in the market. There is all this entrepreneurial activity around small and medium-sized renewable energy, but very few projects can carry through to fruition." It's important to identify these "pain points" and develop economic wind power projects and a workable business model around addressing them. That in itself helps to attract capital, which can be elusive these days even though financial markets are recovering. "Having been in that kind of investor role before OwnEnergy, I understand the capital formation process both around project financing for renewable energy projects and corporate finance, raising money from venture capital firms and other institutional firms." OwnEnergy takes a strikingly different approach from most utilities and IPP developers in that they purposely focus on small and medium size wind power projects. The average size of the projects they take on is about 50 MW versus the 200 MW plus that utilities are often looking for. Some of their projects are as small as 20MW, few are larger than 80MW. A core part of their approach is a local ownership component, meaning one or several folks in the local community have a direct financial stake in the project being successful. "This creates a genuine sense of community involvement in the project so people in the project's footprint and in the community feel they have a say in how wind is going to happen in their community." Another benefit of community wind projects is the creation of local jobs. Studies conducted by the National Renewable Energy Laboratories (NREL) and Lawrence Berkeley National Labs show that community-centered wind power projects provide more local jobs and benefits than projects developed by corporations or absentee owners. Susman noted that OwnEnergy's involvment goes far beyond local people receiving lease payments. "Our approach is to truly partner with a member of the local community who is an entrepreneur, who wants to lead the local aspects of development, and who wants to take an ownership stake in that project. We encourage them to bring in their neighbors as equity participants, part owners, or leaseholders. We are flexible-the importance overall is community involvement and the community having a financial stake in the wind project." A good example of this is the 51 MW Windthorst wind farm project, near Windthorst, Texas, just outside Dallas. OwnEnergy developed the project-which is expected to start construction this year-as a joint venture, along with a local company, Horn Wind. The initial work on this project came from local businessman, Jimmy Horn, who invested in a met tower to confirm the presence of a viable wind resource. He then started the process of obtaining land leases and got the project in the transmission queue. But Horn Wind needed help to go further. "They reached a point in the development process where they needed a national partner who had the network and experience of developing projects when they got to that more complicated and costly stage where risk management and strategic insight become critical in the project reaching a successful completion," says Susman. Since Horn Wind partnered with OwnEnergy, the development of the project has moved along and they recently announced they had sold a majority stake to a global renewable energy company. Both Own-Energy and Horn Wind will retain long term minority interests in the project. Horn Wind hopes to ultimately build five community wind projects in the region. The Windthorst site is quite close to a major power market-Dallas-and that is a significant benefit in a few ways, Susman says. "The more we develop modest sized community wind projects closer to where people live, the more Americans are going to get a direct sense of what wind energy is all about, and it will increase their comfort level of seeing it in their community." Transmission of power to Dallas is also not a problem. "In other parts of Texas, projects are having a hard time transporting their power because there is more power trying to get on the lines than there is actually room for." Talking about the sale of a majority stake of Windthorst to a major company, Susman says OwnEnergy wants to remain flexible in its approach to wind development-especially now, with capital markets still recovering. "Right now, we're finding power prices are depressed in many markets, and project finance capital is expensive to access. So it makes sense for us and our local partners to be able to sell down a majority stake in the project. "That said, I believe we will trend more towards project ownership when the commodity markets recover and when financial markets are more robust and capital is less expensive." Logic may dictate that large wind power projects-some of them mega projects up to 300 or 400 MW-may enjoy economies of scale that smaller projects lack. "The smaller projects may find it a bit harder to compete with large scale projects, mainly on the construction costs side," admits Susman. "But those large projects increasingly have to build large transmission lines or cover the huge costs of transmission upgrades, and that tends to balance things out." Susman says OwnEnergy projects can be developed at a return on investment level that is equivalent to the larger scale projects for a few reasons. The smaller projects might have the cost benefit of a more simplified and less expensive interconnection. Or perhaps the project might be in a pocket of good wind where a large utility or IPP might find it difficult to amass enough land to build the scale of project they need to make it worthwhile. Small wind projects can also help address NIMBY (Not In My Back Yard) issues around development. "Increasingly, there are communities that are not receptive to some of these larger scale projects," says Susman. "But community wind projects of a more modest size can have an easier time appealing to local offtakers, local regulators, or the town or the county to gain support and rapid traction for development." The ideal size for a community wind project can vary by location, the company finds. "If you are in the Upper Midwest or northeast, I think you can support a somewhat smaller project size, down to as small as 20 MW. In the southwest and Plains states, you're better off going a bit larger with the project size. "Generally, we've found that the lower threshold is probably in the 20 MW size range to make a project economically viable and financeable." Susman said he finds the support that renewable energy is getting from the Obama Administration to be encouraging, but he added there is still a high degree of uncertainty. "We need to see the grant extended under the Recovery Act, we need to pass a federal Renewable Energy Standard, and we need to raise the renewable target to 25 percent." There needs to be some specific legislative efforts to support community wind to recognize the societal benefits that community wind brings.He notes that seven U.S. states now have legislation that is supportive of community wind. Colorado has passed a new Renewable Portfolio Standard that has community wind multiplier provisions. For example, if a utility is trying to meet an RPS and requires 30 MW, they can buy 30 MW from a regular wind project or 20 MW from a community wind project. There's no doubt that for people such as Susman, alternative energy is a business, and it has to be profitable. But like many in the wind industry, he says it goes beyond that. "I'm a lifelong outdoors enthusiast and an environmental advocate. I'm someone who is interested in making a living and having a successful career, but who wants to do it in an area that's meaningful to me on a personal level and that makes my two daughters proud of their father." And Susman is at heart an entrepreneur. "When presented with the opportunity to be a renewable energy entrepreneur and also spur innovation and business development by other local entrepreneurs, as we say here in Brooklyn, they made me an offer I just couldn't refuse."